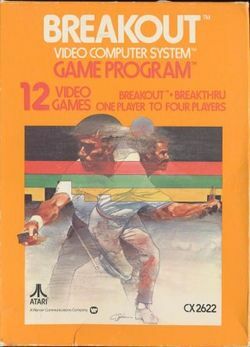 Breakout was one of the eleven Atari 2600 titles that were part of the second wave of games released in 1978. An arcade game of the same name (Breakout) was originally developed by Atari and released in 1976. It was conceived as a single player version of Pong and it was very successful. Atari had previously brought the game home on a first generation dedicated console known as "Video Pinball" before ultimately releasing it for the 2600 (which was known at the time as the Atari VCS, or Video Computer System). The Atari 2600 port was programmed by Brad Stewart. Stewart had been working on a backup project for the Atari 2600, which was eventually canceled. Consequently, Brad and Ian Shepherd were both available to program Breakout for the Atari 2600. They decided to compete in the original version of Breakout for the programming rights. In the end, Brad won. In development, he didn't receive help of the original designers (and was unaware who they were), and felt that there were few obstacles to overcome. Difficulties arose with the Television Interface Adapter. The game was published in 1978 and was conceptually the same, but with a few key differences. First, there were only six rows of bricks. Second, the player is given five turns to clear two walls instead of three. One notable addition was the Breakthru variant, where the ball does not bounce off of the bricks, but continues through them until it hits the wall. Atari had this term trademarked and used it as a sister term to Breakout in order to describe gameplay, especially in look-alike games and remakes. It was released as Breakaway IV under the Sears Telegames label. This page was last edited on 21 October 2009, at 05:09.